We are so close to being finished with this bathroom makeover that I can taste it. Ew… no, that’s a weird expression in this case. You know what I mean. 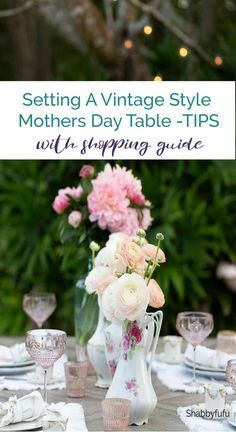 This isn’t so much a how-to post as it is a hey-lookie-what-we-did post. 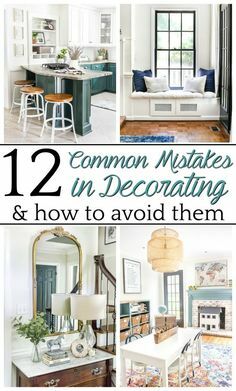 Mainly because I’ve shared two tutorials about painting cabinets when we reno-ed our kitchen and bathroom in our last house, and there’s only so many ways to do it really. Still the power of a good cabinet makeover never ceases to amaze me. If you don’t remember, here’s what our hallway bathroom looked like before. But look how far it has come! We still have the floors and decorating and possibly a window treatment to go. I’ve thought about adding some sort of stencil design to the walls too, but I waffle back and forth on that one. Painting these cabinets Benjamin Moore Coventry Gray perked up this space a whole lot though. I’ve mentioned before that this bathroom makeover is not going to be a forever one. It’s more of a Phase 1 using mainly paint and quick fixes to hold us over until we can do a full demo and renovation. But since that’s likely a couple of years down the road, working with what is already there is the best option. These cabinets are original to the house built in 1960 with doors that look like they were updated in the 80s. So they still leave much to be desired considering they are bubbled up and have tool marks from what looks like an old countertop demo and dings from who knows how many kids over the years. 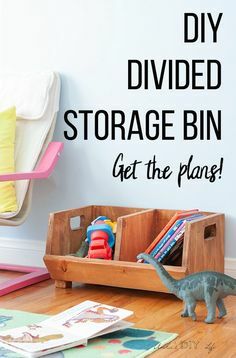 No amount of sanding or wood filler could really fix them. Just don’t look too close and we’ll be okay. 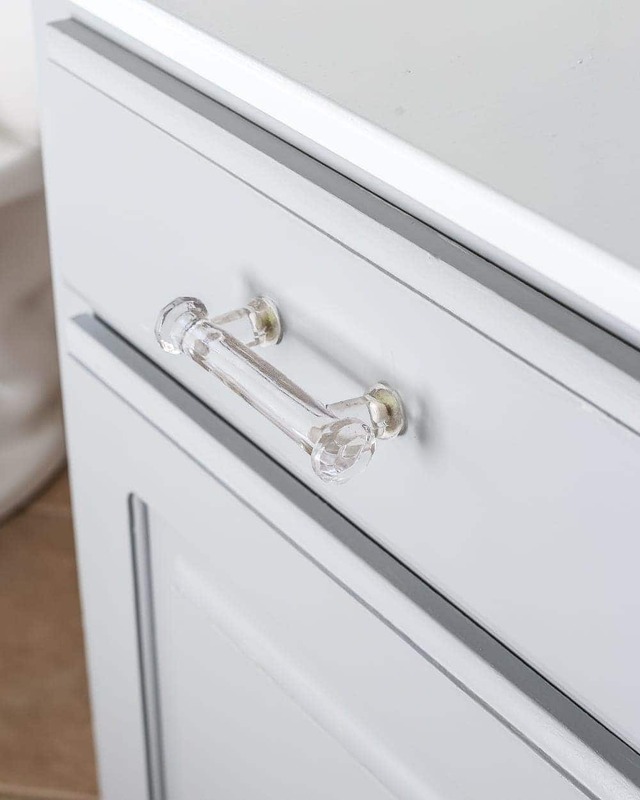 Still, swapping out the old clown-ish looking knobs for these glass knobs and pulls was a huge help. I love that they’re grown-up but still girlish since this is Olivia’s bathroom that will double for a guest bath. Painting that sink and countertop has made a world of difference too, and it’s holding up beautifully so far. Next step now is to deal with that floor. Part of me says to just clean it up and paint the grout and part of me says to attempt to paint the whole thing. I’m still skeptical about the durability of painted ceramic tiles. Have any of y’all done it? …Bueller? What are your thoughts? Painted tile or painted grout? Stenciled walls or leave as-is? Hang a window treatment or leave it bare? Holy decisions, Batman! Wow, it’s crazy how much you have transformed your bathroom with just the change in wall color and glass replacement shades! 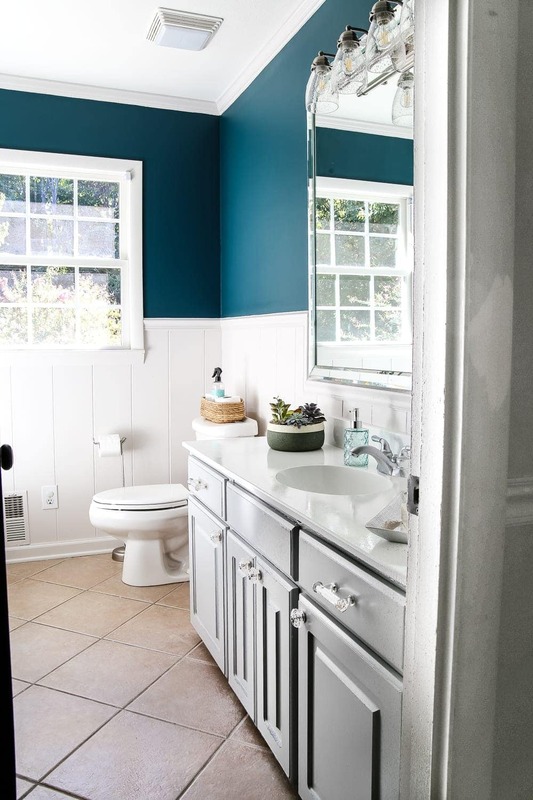 The Magnolia Home Weekend paint looks so good I am tempted to paint my master bath. It’s a gross shade of brown at the moment. 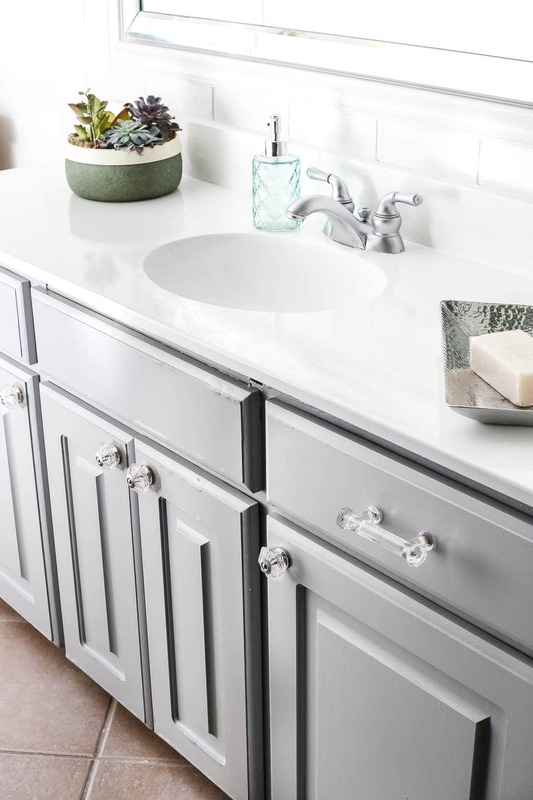 Do update us again on the sink and countertop paint! Just told my husband about it and he said he needs to see it in person before he would attempt to paint our sink for me.. I certainly will! So far so good. 🙂 I’ll try to update a few months down the road. I like the look of stenciling on the floors, but these tiles have a really rough texture, so I don’t know if that would spell out disaster or not. I agree. I’m thinking paint all over now. 🙂 Might as well! I am actually buying a house that has this same exact tile, and my idea was to paint it also. 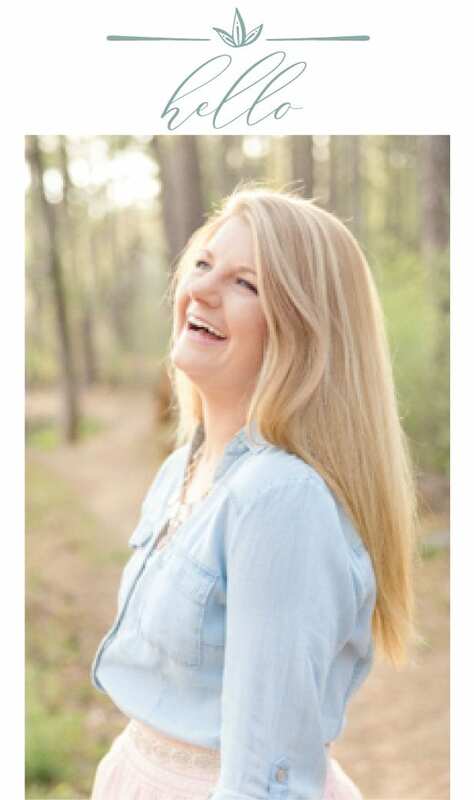 I can’t wait to see what you do! The bathroom looks great! This gives me lots of ideas. Thanks! ? It’s tricky flooring. We have it in our master bathroom and all throughout our kitchen so… we’ll see what happens! I LOVE the wall color in your bathroom! 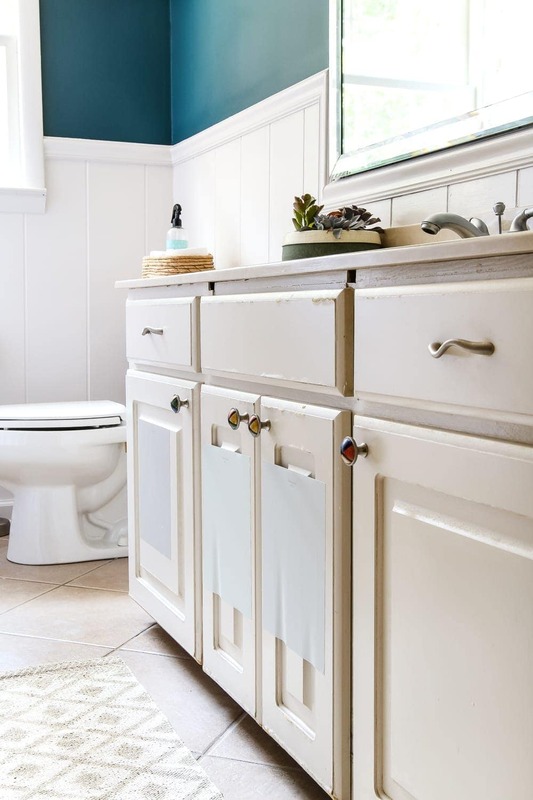 It’s a great pop of color and it makes the bathroom look larger. What color would you paint your floors? Thanks, Patti! We’re digging it too. I’m thinking a slate gray so it’ll look like slate tile? I wouldn’t bother with a wall stencil. Sometimes less is more. The rest is great. No stencil on the wall but definitely a curtain. I love it. Now to Hobby Lobby for those knobs. I am currently redoing our new to us home. 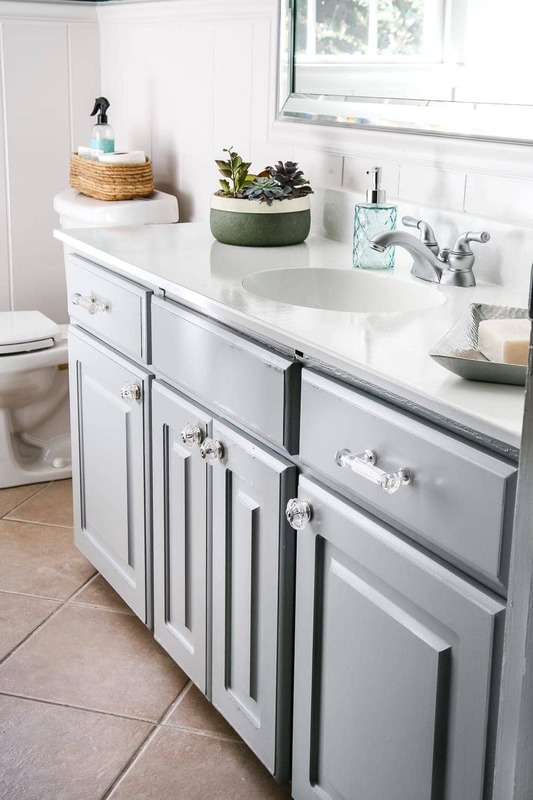 The guest bath is small, so I painted the cabinet the bold color, and the walls a pale gray. I put in a new countertop, and a copper vessel sink with a waterfall faucet. It wasn’t an expensive redo, but it looks so much better. I love the colors you picked. I am shamelessly stealing your faux tin backsplash for the kitchen. Lol, I used simply white for all my trim and doors in the house, along with the upper cabinets in the kitchen. My wall are shades of gray. It’s a beautiful white. We’ve used it all over our house too. Go for the gusto on the floor! Plain the whole thing. Not a fan of stenciling so I wouldn’t do that, but I would add a nice wooden (wood tone) shade to that window. We live on a very secluded lot and never close our blinds in the bathroom because hey who’s going to see you, but guests always close that blind. So with that thinking – I would def do some kind of window treatment. Love what you’re doing in here!! Thanks, Amy! I’m thinking the same thing. Maybe a slate gray would be pretty so that it would look like slate tile? I might possibly brighten up the grout too. I agree with you on the shade. It could add some nice texture, and even though it’s not really possible to see in the window from outside, it probably would be uncomfortable for guests. Love it! Where is that cute planter on the counter from? I need that! Wait.. what??? A puppy? I follow you on Instagram… but how’d I miss the puppy??? Oh.. and love the bathroom too… but that goes without saying cuz I love everything you “redo”… you have such a vision! Good luck on those floors… you’ll end up with something amazing!!! Check out Paintmewhite Instagram acct. 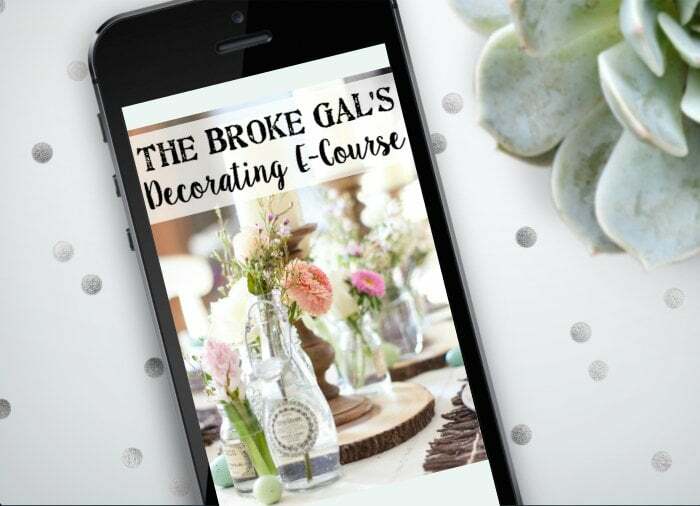 She painted floor tiles with Annie Sloan chalk paint, and tells how on the post. Quick fix! Before and after pics. I say, window treatment, no stencils and paint the grout at most. 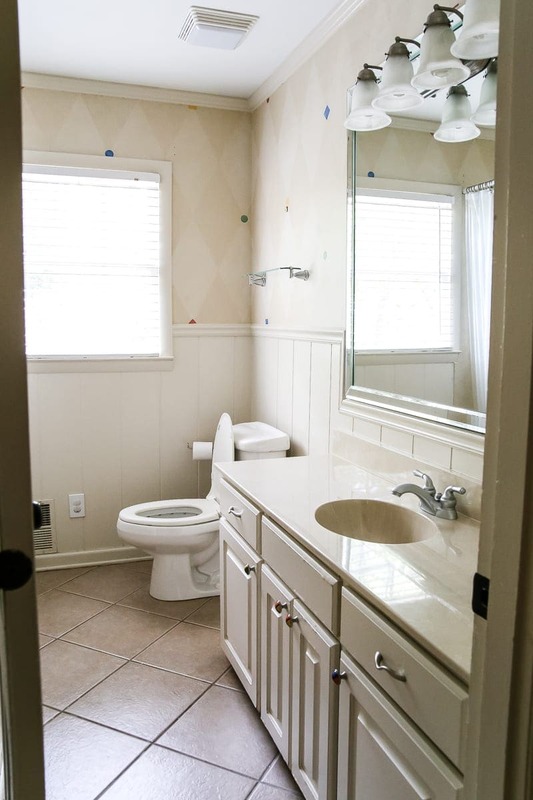 While the tile really doesn’t go along with what you’ve done in here so far, if you paint it and it doesn’t hold up (or you make a mistake in regard to technique or color choice) you could be doing a floor demo MUCH sooner than you had anticipated. Grout seems like it would hold paint much better/longer, plus you might be able to seal the color in. I’ve been thinking the same thing, Esther, on all 3 counts. 🙂 Too many ideas! I’m voting to paint the tile. 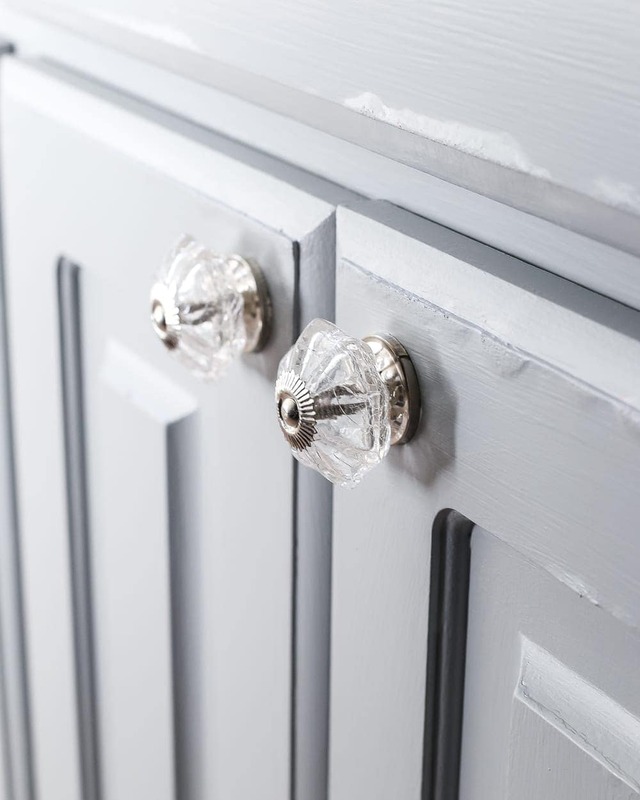 Love the color on the cabinets and those knobs are pretty. Boy, call me a novice! Who knew that you could paint a sink!? Well, clearly you did! I love your blog. I just retired this summer, and for the first time ever I am looking at blogs. Yours is the first that I am actually signed up to follow. It resonates because I am a life-long “repurposer”. Looking forward to seeing what you share next! Blessings to you. I thought our second-story, middle of a two-acre lot with trees bathroom window was private enough to not need a window treatment. Until I saw, from across the acres and through the trees, my neighbor’s brightly lit bathroom window, and my neighbor! Some things just can’t be unseen! Now I will always vote for a blind or shade on a bathroom window! 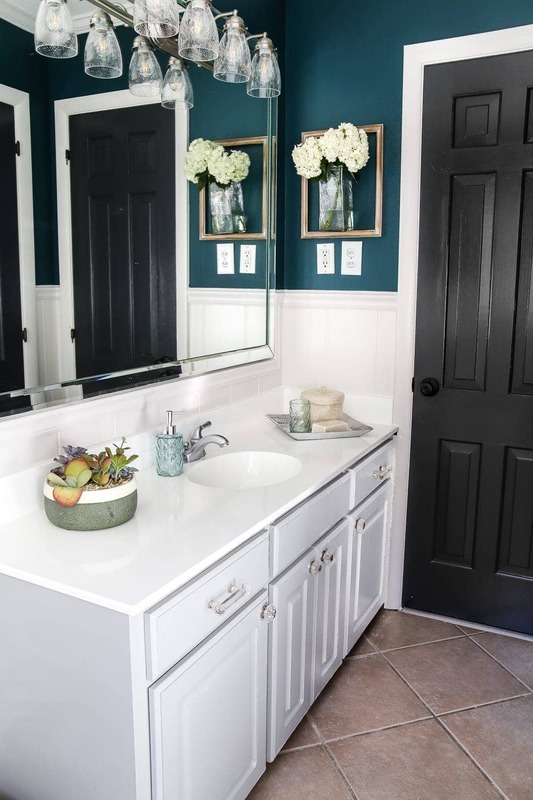 Love the dramatic wall color you used, and the color on the vanity. Those glass pulls are to die for! Thanks for all the inspiration! It it looking so great! Jess at the Bright Green Door did stenciled floors on her tile for last year’s One Room Challenge, and they look amazing! I’m still in awe over them. Just a thought! Love it. 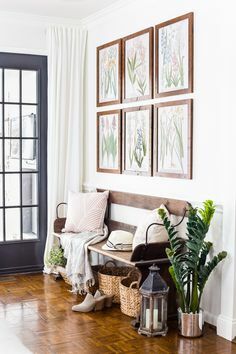 I would wait until you are done and decorated to decide about the stenciling. You may find its enough as is, and I love the depth of the color, or you will see that it needs that little extra zing–but as soon as you’re done, you’ll know. 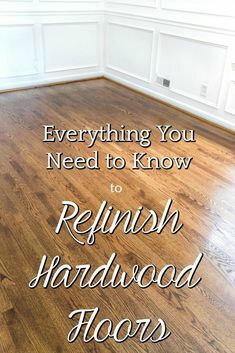 Can’t wait to see what flooring you choose. Paint the floors! I’m not a fan of that type of tile as it looks dated. I think you should try to paint and seal them! Love what you’ve done so far. I adore the wall colour and the grey cabinet colour and the updated light. I personally would not stencil the walls. Keeping it plain is more modern. I would add some black and white prints or cartoons. As for the floor, I would paint it provided you prepared to repaint perhaps once a year. If you going to stencil a pattern this is where I would do it. Today I was in the hair salon and spa (umm I’ve never used that part but it would be wonderful!). Before people were painting tiles they put in the real deal–large Italian tiles on the wall. Half way up. But the floor tiles were a gray. I took note. The tiles looked almost like they were hand painted as each was a bit different. The gray was similar to your cabinet but matte. The tiles seemed like the paint was lightened and blended to the edges. Other tiles seemed to have the gray of your cabinet at the edges but blended to be lighter on the edges. The grout was not emphasized. It was not a smooth tile–large squares. Maybe 20″-24″?? They had little holes in them as a fired clay piece might have. I thought–this might be what I do. A coat of the one color. A lighter or darker gray. And then just use the well kind of like you did on your fireplace. Smear look. I can’t explain. But it did look classy. I also noticed that their pattern tile was a larger simple design and not stark in contrast. It was a white background with the lighter gray which was not precise in color applications. Each tile was not messy but looked like it was hand painted. Just an idea. Check out some real authentic Italian tiles to get ideas? Maybe these were not Italian but they were not run of the mill. It looks so elegant yet “homey” because of the natural look of the tiles having imperfections. I love your bathroom It looks so great. It’s amazing all you’ve done to make each space beautiful. I vote no on stenciling the walls. I love what you’ve done so far! That wall color is gorgeous. I’m in a similar situation as you with tile and holding off on the big reno for now. I ended up buying groutable peel and stick tile from Home Depot. It’s so beautiful. I paid less than $80. The one I used is TrafficMASTER Ceramica in Cool Grey. I used Delorean grey grout. Can’t wait to see what you end up doing. Good luck! Paint the grout! I love what you’ve done!!!! I think I’d be reluctant to paint the tile simply because of durability? But hey, you take gambles that pay off all the time! When you paint cabinets with recessed inset panels, do you caulk the space between the inset and trim? How do you get that space to look clean and even without paint drips?